To my knowledge, there are no systems of correspondences of Elements to directions that go back to 5000 BCE. The earliest such correspondences could have arisen would have been in cultures that developed astrology – likely going back no further than Babylon. Not even Egypt had such correspondences that I know of – though they did have the four Sons of Horus as the pillars of the four directions (associated with the arms and legs of Nut), I’ve never seen any Egyptian text that associates them directly with four Elements. From astrology we have Fire in the East (Aries), Earth in the South (Capricorn), Air in the West (Libra) and Water in the North (Cancer) – an arrangement that still existed when Agrippa wrote his work (see Three Books of Occult Philosophy – Scale of the Number Four). Another, perhaps sidereal, version would use the fixed signs: Leo in the East, Taurus in the South, Aquarius in the West and Scorpius in the North. I’ve never found anything definitive on where the Air in the East arrangement – common in the Golden Dawn, Thelema and thus Wicca – came from. However, the GD was very into Ezekiel’s vision – which shows God’s Throne supported by the four Kherubs whose faces are Man (Aquarius) in the front, Eagle (Scorpius) behind, Lion (Leo) to the right and Bull (Taurus) to the left. If you face the Throne Eastward, and assume that “right” and “left” are from the perspective of the Throne itself, that gives the usual arrangement of Elements to the directions: Air-East, Water-West, Fire-South, Earth-North. However, there is some ambiguity here. In Ezekiel’s vision (approximately 600 BCE), the Throne is not facing the East – he describes it as coming out of the North and facing/moving Southward. That would put the Man (Air) facing South and the Eagle (Water) facing North. If we still assume Ezekiel’s mention of “right” and “left” are from the perspective of the Throne, that would put the Lion (Fire) facing the West and the Ox (Bull) facing East. That would give you Earth in the East, but not Air in the North. So I don’t see any traditional source for the arrangement [you mention] – and sure as hell nothing going back as far as 5000 BCE! lol Good luck! UPDATE: Looks like Alex Sumner can tell us where the Golden Dawn got its “Four Winds” (aka Seasonal) attribution of the Elements to their directions. In the same blog, he reveals something fascinating: the “ADNI Formula” (as opposed to the better-known “YHVH Formula”). Awesome! Myself and others often use the Fire in the North (south for you Northern Hemisphere folks) because that’s the warmest side of a building or street. Originally I have used fire in the east a dawning star, light of renewal and life and illumination, but when doing service to wardens of the watchtowers I found that the north/fire correspondence was what awaited me on my journey. On a similar note Water was always west, which on an island makes sense as the setting sun (underworld, death) passes into the waters. Just as life yields to the fluidic unknown and other mysteries of the beyond. Very much a veil of tears for/from the departed about those they will miss. The South (North for the Infidels), was the darker times, the cold, damp part of the house, and the cheap and often phlegmy side of the street (with colds and molds and buying for cheapness being the norm). Thus one plants into the colder Earth; at slower, sleepier times. A hibernation of the seed in the Earth. The dark coolness, balancing out the destructive scoring heat of summers fire. Which left the poor cousin Air, in the East, of bright crisp mornings, potential of things to come and the clear head of meditating after a good nights rest. One did not seek to control the Air, merely marvel in its call and promises. A good time to plan out a day, to do a pathworking, juist just revel in the senses when they are at their lightest. – Built from first principles. Interesting article. Concerning the placement of the elements with Air/East, Fire/South, Water/West, Earth/North, it seems obvious to me that it is based on the dominant type of weather during each of the four season of north-west Europe : Spring (morning, East) : warm and wet -> Air; Summer (midday, south) : hot and dry -> Fire; Autumn (evening, West): cool and wet -> Water; Winter (night, North) : cold and less wet than autumn -> Earth. These dominant types of weather were called “winds”, from what I gather. But the dominant charactrer of winds in Western Europe is not the same. Eastern winds are cold and dry (Earth), north winds are cold and wet (Water), west winds are warm and wet (Air), south winds are hot and dry (Fire). Ah yes – It’s a shame I didn’t expand on the mention of the “four winds” in my post with discussion of the four seasons. Thanks for adding it! Although winds were associated with weather (for example see Aristotle), they were not associated with seasons (not to my knowledge, at least). Spring does not equal eastern winds, nor does summer southern. I did have a table of the characteristics of winds per season somewhere (based on actual data) that contradicts any common attributions (dry west winds etc). For a bit more on winds and elements see my comment to Alex’s post on his blog (http://solascendans.com/2013/08/24/the-placing-of-the-elements-in-a-golden-dawn-temple/#comment-5842). And the World card clearly shows the four elements or directions based on the Fixed signs of the zodiac and not the Cardinal signs. I see many contradictions here! BZ, the order of which you speak derives from the Convoluted Forces. This is not a static system, but revolves with the heavens. In this light, the sequence in which you have placed the elements is exactly the same as the YHVH formula, but starting from a different element. Thank you Aaron for this post. GD elements and winds are a bit of an obsession of my own and I’m always glad to see some more info posted on the subject! I also corresponded with Raven around the same question recently and he pointed me to this discussion. I would agree with you that there is no system of the four elements attributed to the directions going back to 5000 BCE, in fact I find the idea rather absurd. David Rankine and I researched the origins of the elements quite extensively when we were writing our books Practical Elemental Magick and Wicca Magickal Beginnings some years ago. The earliest reference to the four elements which were able to find in Western mysticism dates to around 500 BCE, and can be found in the writings of Empedocles. 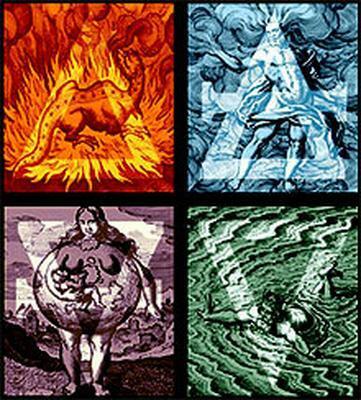 In his Tetrasomia – which is a Doctrine of the Four Elements, Empedocles expressed the view that the four elements were not only the building blocks of the universe, but also spiritual essences. However, he did not name the four principles as “elements” but rather used the terms rhizai, which means ‘roots’ and rhizomata i.e. ‘root-clumps’ – he was a herbal magician, so this makes sense in the context of his work. Aristotle in the 4th century BCE subsequently expounded on his work, especially on them as spiritual essences. Some years later Plato continued the work, with his own new take. There is a bridge between the work of the Greek philosophers and that of Egypt, with Manetho 3rd century BCE recording a deity attribution in which elements are named and attributed to different deities (example, ‘the moist element is named Oceanus …’). Philolaos attributed the elements to the four segments of the zodiacal circle – which is likely to be the first attribution to directions in a circle. The attributions which were used in the majority of esoteric texts, can be traced back to Zosimos of Panopolis’ 3rd century CE text Upon the Letter Omega – and gives Fire = East, Air = South, Water = West and Earth = North. The current attribution used in most forms of Wicca and modern Paganism,( ie Air = East, Fire = South, Water = West and Earth = North) most likely originates with Eliphas Levi, which means it is mid-nineteenth century, when he switches the directions attributing Salamanders (fire) to the South and Sylphs (air) to the East, with Undines (Water) in the West and Gnomes (Earth) in the North (Transcendental Magic). Levi’s work was available and studied by the members of the GD, so likely this is where they picked it up and whence it filtered down into other forms of modern magic and the pagan revival. pleasure – its pretty much my response to Raven last night, so thought it would be interesting to add. I feel you might be right saying the the GD attributions originate in Levi’s writings. The only thing that bothered me since ever is why are the winds specifically mentioned when explaining the attributions. The tradition of attributing astrological/astronomical qualities to ‘winds’ goes back as far as ancient Mesopotamia. But none of the Mesopotamian texts give the same attributions as the GD papers. Incidentally there is a very interesting article by Deborah Houlding on Hippocrates, Humous & Temerament Theory (http://www.skyscript.co.uk/humours.html). She interprets his ‘On Airs, Waters, and Places’ attributing Humours to the directions in the same manner that GD attributes the elements to the directions. I recommend to read the source text first though, because imho the interpretation is very slippery. Hippocrates actually never specifically attributes the humours to the directions in the above-mentioned manner it’s just Deborah’s interpretation that does so. It is up to the reader to agree or disagree with her. Could you please quote/cite/refer specifically to which chapter/passage Zosimos attributes the elements to the cardinal points? I can’t find the book “On the letter Omega” on the web, just fragments, and from what I have read, there is no such attribution. Thanks Aaron, I got confused because of the Aces attributions. I can’t say that I agree with him because I see symbols as transcending our earthly existence, they have to do with principle. After all the elements and the seasons are different north and south of the globe. Another very credible system by (Z.B. Halevi) is that Malkuth is the material (pentacles), Yetzirah is the watery world of changing images (realm of Yesod) and so should be associated with Water and cups, (not Swords/Air). Briah is Air (swords), Fire is the primal light / space of Atziluth (wands). (sometimes these last two elements are reversed). Of course I understand that you can’t fit 7 planets into 36 decants and that this is a compromise. Alas, on this earth nothing quite fits. Our sun/moon/earth calendar is up the creek for starters! BZ, this is not a GD invention. It is at least 2 thousand year old astrological attribution of planets to decans, known as ‘faces’. Yeah – Agrippa also gives this same list of faces (alongside another method of attributing the decans) – both of which he states are ancient. He is likely the GD’s source. I Agree, Agrippa is most likely the GD source. As for the decan system, it is *the* oldest system of decans used in antiquity, when Babylonian and Egyptian astronomical knowledge merged in hellenistic astrology. See Liber Hermetis or Antiochus of Athens for comparison. I will have to see if I can find a source for it myself, but when i was kid (and not as apt to ask for sources) I was taught that the arrangement used most commonly came from the geography around Jerusalem. Looking at the map you see it easily: Mediterranean in the west, Greener lands of Turkey to the North, Arrid lands of Jordan and Iraq to the east, and of course the warmer lands to the south. Like I said, no textual reference that I know of, but I thought it was worth mentioning. I’ve heard this same theory myself (also unattributed) – but I don’t think it really stands up to history. If the Biblical record is any indication (Ezekiel, etc), they were more interested in the stars (Man, Eagle, Lion and Bull) for their attributions than in geography. Plus, our modern concept of the four Elements of nature originated with Empedocles – who lived in a Greek city in Sicily in 5th Century BCE. And he wouldn’t have had the same geography as they had in Israel. I will have to find a text, but I think that the elements use in Buddhism pre-dates Emedocles. And in Buddhism the directions are linked to the geography around My Meru, so its a similar situation. Even if it doesnt pre-date though, Empedocles need not be the source for directional attributes, especially not the Air-East correspondence. While in general I agree about the stars over local geography being of interest, I would make an exception for the Temple Mount. The orientation of Christianity as a recovery of the Temple cannot be overstated. All this though is conjecture until I can dig up some sources. Yeah I have no doubt the Bhuddist system goes back a long way. Though that wouldn’t likely be the source for the GD, as their primary source for Eastern material was Theosophy rather than actual Buddhist sources. As far as I know, the GD took their Elemental system from Eliphas Levi, and I suspect Alex Sumner is correct that it came ultimately from “Tetrabiblos” by Claudius Ptolemy. I don’t think I’ve seen any Elemental associations for the Temple of Solomon… At least outside of the Golden Dawn’s interpretation of the Altar of Burnt Offerings, Laver of Brass, Altar of Incense and Table of Shewbread. Though these were not placed in the four cardinal directions. Aaron, check my comment on Alex’s blog. There is no way that elemental attribution can be attributed to Ptolemy – he gives completely different elemental associations both to winds and to directions. Check also my reply to Sorita – the best connection we can make to antiquity is by linking it to the text of Hippocrates, but it is quite stretched imho. The system that makes the most sense to me personally was put forth in the 3rd century CE by Zosimos. It puts Fire in the East, Air in the South, Water in the West, and Earth in the North, thus giving us a progression from the least to the most dense elements. But that’s just my preference. You know, the sun rises in the east and its a big ball of fire so I always put fire in the east and its opposite (water) in the west. Air is lighter than earth so I want to put it north although every magical system puts earth north. Magick is usually very sensible. I have a massive amount of notes on this subject… somewhere around here. In my specific path we have East – Air – first breath. South – Fire – strength/adulthood. West – Earth – Death. North – Water – Limbo/Pre-existence. If we start in the North we work from Densest to Lightest, and it likewise follows the earth invoking pentagram of:spirit drawn to Earth->water->air->fire->spirit. It also correlates to the lower Sephiroth on the Tree of Life. Feet in Malkut/Earth, arms stretched out on either side to Hod/Water in the north and Netzach/Fire to the South, Head toward Tipheret. For our practice and our desired outcome it works well. I really think it comes down to what the work is being done. Does it make sense to the practitioner. If it flows well and fits the intended purpose, I think the location of the elements matters less than the aspects of those elements themselves. I’ve heard the weather theory a lot, and that may be how it originally developed in some areas, but the modern associations were derived Qabalistically. I believe the GD association of Air in the East, fire in the south, water in the west, earth in the north are based on the elemental attributions of the letters of YHVH, starting in the East and going clockwise. Crowley later used this same association a lot since he came from the GD, which is why I think it caught on with modern magic and paganism. Since Wicca began as an OTO offshoot, that association stuck and was further popularized. Crowley also changed it up though, even though some rituals use that association, he changed the positions of fire and air in the tetragrammaton. The Star Ruby takes the tetragrammaton, starting in the East and going counter clockwise to yield fire in the east, water in the north, air in the west, and earth in the south. In Liber V vel Reguli the associations of the quarters are derived from taking the tetragrammaton backwards, also starting in the East and going counterclockwise to get earth in the east, air in the north, water in the west, and fire in the south. Well, common sense puts fire in the east as the sun rises. Opposite to fire in the west is water, the opposite of fire. Water comes from above so it should be north and opposite is earth, and heavier, so it should be south. I agree with the astro-logical. This place the Opposite Element in opposition on my Altar, and feel Balanced to me. But that is only my way. I think everybody should use what feel balanced/natural to them, as spirituality is a personal thing. drakray, i like how you do this … i do also, i placed my comments seperately here in a new post, i’m just saying this here so u know & can look if you wish … i might add that i have build a meditation garden following this pattern with a Medicine wheel as the center, but set in each direction leading to the center of the wheel: East a water fountain, South, a miniature Stone Hedge for the Earth, West, a fire pit, North, a copper pipe pyramid with solfeggio wind chimes for the Air element … its so wonderful to meditate & do ceremony, i do everyday, at always in the winter months, but some even then. I quite like this idea as it can be used no matter what hemisphere you’re in! As a very earthy witch in the southern hemisphere, with less of a personal draw to ceremonial forms of magic and more of a connection with concepts when I can see them echoed in the world around me, I find an extremely localised approach is best for me (though this means I have to reconceptualise my correspondences every time I move!). Doing your correspondences because “that’s the way we do it” means little to me. So fire is east for the sun, water is west for the ocean and a nearby lake, earth is north for the vast amount of land above, and air is south for the chill winds from Antarctica and the hole in the ozone layer. This way, too, pure masculine fire is placed opposing pure feminine water. This doesn’t seem to be a popular or necessary rule to follow, but it makes sense to me. But I still really like your version because it doesn’t exclude anyone from using it. I will have to think on it more, though; fire in the west is a strange concept for me. 1) East-Water-Spring: with the morning dew, life begins, the Water of life, the Fountain of Youth, our childhood, we gestate in the womb-water-sack (where it is as if we & the Water are One). 2) South-Earth-Summer: when/where the seeds are planted (in Springtime) & now grow (in Summertime), we put down (South) roots & are nourished & nurtured by our Mother Earth (She is our foundation, the soil & ground of our being, a place to grow … as if we & Earth are One), it is the Summer of our Youth/young adulthood, where we are free to chose, to travel & venture upon the whole face of the Earth (yet with responsibility, for we are to care of Mother Earth even as She cares for us – not unlike the care of lovers for each other – where we are free to pick the flowers & hug the trees, just because we love them). 3) West-Fire-Autumn: where the colors of falling leaves are golden & crimson like fire, & where we gather in what Earth-Mother has provided us, so we may now consume fire-like & burn (as food within our bodies) for energy, the cornucopia of harvest. The labors of Summertime now pay us dividends as we reap a harvest of wisdom/life experience. It is a time of prosperity & plenty when we are also able to share freely with others what we have gathered to ourselves over the years – lest it be horded to decay & spoil like fruit left on the vine. Thus, many loved ones may gather around us to the warmth & glow of the home/love fires burning in hearts fueled by a lifetime of growth. Like a refiners fire burns away the dross leaving only the gold, so too are the Autumn-Fires of the West, the place of the Golden Sunset (so is the all consuming-fire-like-heartfelt-passion burning within us of gratitude, love & joy we feel near the endings of life – it is as if we & the Fire burning within us are ONE). 4) North-Air-Winter: the circle of life completes here with the shortening of daylight (foreshadowing the shortening of our days). With the icy cold blast of the North Wind, it is the cold Air that now stings & bites us, not the floods of Spring, not the siring heat of Summer Sun baked & cracked Earth under bearfeet, nor the rustle of the dead Autumn leaves & branches crackling as kindling for our Winter-warmth. But now in Winter, it is the cold crisp Air that we feel most poignantly numbing our skin, chilling our lungs & forming ice crystal clouds before our eyes with every exhalation as we traverse our final steps upon the path to life’s journey’s ending. Strangely, somehow the cold Winter Air is invigorating, refreshing to us, not something to be shunned at all, but to be welcomed & embraced like two lovers, or long-lost friends, being reunited. Like the vibrant Sound (carried upon the Air) of freshly fallen snow crunching under foot on a clear starry night, that mesmerizes us into an ethereal altered state of consciousnesses preparing us for the long Winter sleep (it is as if the sound & the feel of the Air is One with us) It is now that we feel the longing most to dance with the stars & the Moon & to fill the vast expanses of the far flung Galaxies & to return to Source … until we awaken again & the circle begins once again. If anyone knows the origins of this pattern as seen with Dhyani Buddhas for the 4 directions-elements-seasons, I would like to hear from you, or also any thoughts you may have of your own on this topic. This is interesting, though obviously very much a product of placement. In Australia we’d have more than a little trouble associating summer with nourishment, winter with harshness, and Autumn with red-gold leaves! The directions/elements takes up a lot of my metaphysical thinking time lately. I’m struggling to come to a conclusion that I find completely satisfactory. A large focus of my personal tradition focuses on “balance”. I’ve always felt drawn to the idea of balanced polarities and that the ideal nature of the world is to be at balance between equal and opposite forces, ie, light/dark, “good/evil”, male/female. While I believe the appearance of these things as being opposites is simply an illusion based upon our limited capacity to perceive and a need to categorize the world around us, I find that codifying the world in this way is useful both for theoretical and practical purposes. Therefore I always found the accepted or standard correspondence of North/Earth, East/Air, South/Fire, and West/Water to be awkward. My instinct is to balance the opposing elements. While far from being finished, my current working model is North/Air, East/Fire, South/Earth, and West/Water. This places the “opposing” elements across from each other, and satisfies my desire for balance. However, I have struggled to find much in the way of external corroboration for this set up in literature or online. While I also ascribe to the idea that “if it works for you, then go for it”, I would be interested to hear others opinions or thoughts on the matter and if you know of any other systems or traditions that operate with this set up. North: the north is a broad relatively empty expanse with little to inhibit the fierce, cold winds of the arctic. They blow across the tundra and ice freely. South: this one I struggle with the most really. Other than the fact that there are large expanses of land and mountains to the south, all I can think is that “south” makes me think “down”, and “down” makes me think of below my feet. It’s weak, I know, but it’s what I’ve got at the moment. West: the ocean lies to the west (of course it also lies in the east if one really thinks about it). For some reason though the west has always meant water to me. Could be all those years reading Tolkien and his talk of “sailing into the west”, but it feels right. Anyway, just a few thoughts. Any comments and or suggestions would be most welcome if anyone is still reading this thread. Regards. I feel as though north should be air .. east should be earth .. south fire and west water. this alternates the male and female aspects of the elements .air being male .. earth female.. south male and west female..